Halloween is coming quickly and soon there will be little ghosts, goblins and witches knocking on your door looking for some sweet treats. As the big day approaches, you may find yourself inspired to throw a Spooktacular Halloween get-together. Whether you plan for your party to be a soiree for neighbourhood children, an adults only get together or a spooky family affair, there are ways to make this the best Halloween get together, ever. The first order of business when planning a Halloween get together is choosing a theme. Choosing a theme helps to get your creative juices flowing, helping you to choose everything from the right invitations to the best menu to serve. What’s fantastic about a theme is that it gives your guests inspiration for their costume. Whether you choose to do a monster mash theme or even a witches brew theme, your party will be a great success. You can even simplify it and just make it all about pumpkins! Once you have chosen your theme, you can start to send out your invitations. Just remember, many people will be making plans for other Halloween events or even trick or treating. Send out your invitations as soon as possible to give your guests time and ensure a higher attendance. Make it very clear that you need people to RSVP and include anything you may want them to bring as well as the theme or any other special details. You could even invite people over for a simple dinner before heading out together for trick or treating. Sloppy Goblins are quick and easy to prepare, even for a crowd! This is a fun activity the whole family can partake in. From carving pumpkins to creating a haunted house scene, everyone can decorate for the get together. Consider turning each room of your house into a different spooky scene like a graveyard, a witch’s lair or even a bat cave. 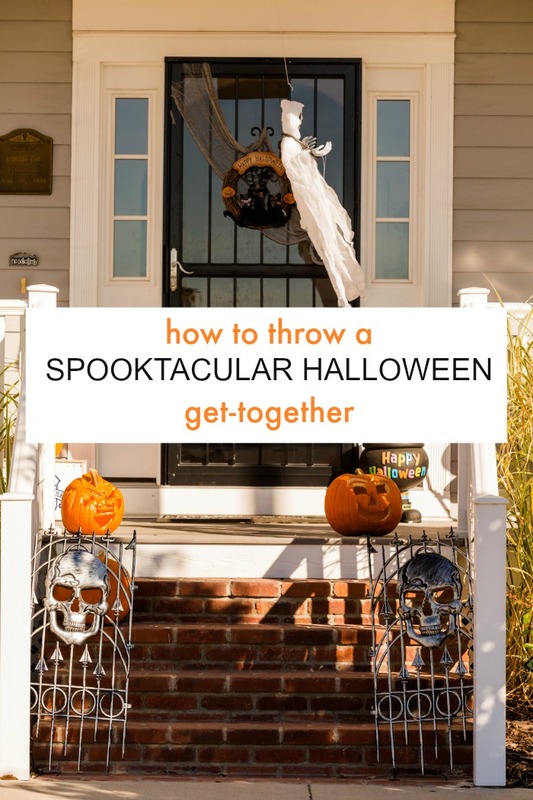 This is a great way to get creative and add some Spooktacular flare to your get together. To simplify things, just decorate your house for Halloween and the get together all at once. Simple dollar store or DIY items to add a spooktacular touch to various corners of the house can go a long way. Consider adding a few surprises here and there. Some cobwebs inside a kitchen cabinet or glow in the dark bats in the bathroom can be fun! Get creative with the food your serve to your guests. After all, every get together requires yummy food. 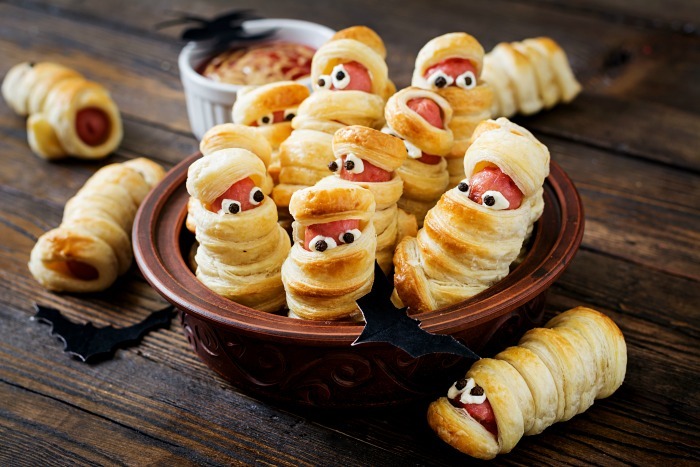 Whether it’s Crazy Eye Cookies, Halloween Graveyard Pudding Cups, or Scary Witch Fingers your guests will appreciate all the extra effort when they are served themed snacks and desserts. Make sure to label your dishes so everyone knows how truly Spooktacular they are. Once you have your theme, invitations sent, home decorated, and a menu created, it is the perfect time to choose your costume. There are several no-sew Halloween costume ideas for the whole family you can choose from. Perhaps you want to wear family costumes and all dress up as characters, or maybe you just want to go rogue. Whatever you choose, now is the best time to do it. Every great party has amazing games to play. Create a list of spooky games to play like a treasure hunt, a haunted maze, or even just gather around in the dark with a flashlight and tell scary stories. Setting up activities for your guests will keep everyone entertained. There are so many different songs that will get everyone up and moving at your Spooktacular get together. When putting together your playlist, consider adding a variety of different music from different artists and genres. There are so many different songs perfect for Halloween. While being the host can have its setbacks, don’t allow them to take away from the fun you can have. Make sure to give yourself time to enjoy your own Spooktacular get together. Hosting a Spooktacular Halloween get together this year doesn’t have to be complicated. Take the time to plan ahead and you’ll be all set for the fun!